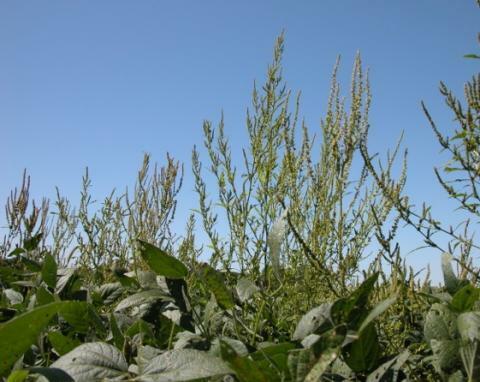 Water hemp is one of several weeds building resistance to Roundup herbicide. Dow Agrosciences has engineered new crops that can withstand the herbicide 2,4-D giving farmers a new tool against weeds resistant to Roundup. The USDA released a draft environmental report Friday that puts those seeds one step closer to commercial release. Iowa State weed specialist Bob Hartzler says if they’re approved the crops would give farmers a new use for an old weed killer. That’s because, Hartzler says, weeds will eventually build resistance to 2,4-D. That drawback is also pointed out in the USDA report. 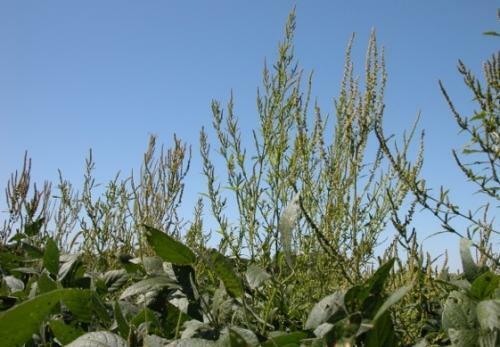 If managed properly 2,4-D resistant crops would work for a time, but eventually weeds like kochia, water hemp, and palmer amaranth could end up being even harder to kill. “If farmers adopt these herbicides and use them in the same way they’ve used herbicides for the past decade it’s very likely that resistance will show up fairly quickly for these products,” Hartzler said. Another drawback pointed out by USDA and critics of 2,4-D crops is that increased use of the chemical could harm sensitive vine crops like grapes and tomatoes. Dow has responded by reformulating its 2,4-D to reduce drift into neighboring fields. The EPA could also decide to place restrictions on farmers and pesticide applicators to protect sensitive crops. USDA regulators are taking comments on the draft environmental report, but won’t make a final decision on whether to approve the new crops until the EPA also weighs in. Dow expects that will happen in time for 2,4-D crops to be ready for the 2015 planting season. Farmers and weeds are in a constant competition. But with Monsanto’s introduction of Roundup herbicide and genetically engineered Roundup Ready crops in the mid-1990s, farmers gained a clear edge. The seeds, which were able to tolerate the herbicide, were adopted quickly. By 2011, more than 90 percent of soybeans and cotton, and more than 70 percent of corn were planted with Roundup Ready seeds.